I haven't been able to bake the monthly breads on We Knead to Bake through most of 2015 much to my disappointment, and have only watched as others baked a variety of beautiful breads. Luckily I managed to do the October bread and I am so happy I did! The Irish Barmbrack turned out to be one of the very best breads I've ever baked in my life. Not only was it quite easy, it also had enough unusual things going to make it quite different from any bread I've done before. But then, that's the beauty of the WKTB group - we bake breads from all over the world learning new recipes, new techniques, new flavours, and new breads, of course. The Barmbrack is full of fruit and is mildly sweet. Commonly made a Halloween, the bread is often filled with charms that are fun to find while eating the bread. This is the recipe shared by Aparna for us to follow. However I did make a few changes according to the ingredients I had at hand. I followed the technique as given in the original, of course. Most of the kneading was done in my stand mixer but once I added the soaked fruit to the dough I hand kneaded only. In advance soak the dried fruit in the hot tea in a bowl and let it steep for a couple of hours or more. I put the tea leaves in a fine mesh strainer and left the strainer in the bowl to steep so that the tea flavours could be absorbed to the maximum by the soaking fruit. Once the fruit becomes quite plump discard the tea dregs and drain the fruit carefully. Reserve the tea liquid. Put the fruit in a strainer and let them drain while you get the dough going. In the bowl of your mixer mix in the flour, yeast, sugar, spice powders, and salt. Give it all a stir. Add the beaten egg and the butter and mix again. In a measuring jug mix milk and the tea liquid to make up one cup. I had loads of the tea liquid so I used half milk and half tea liquid. If it's gone cold warm it a little in the microwave. We're going to use this liquid to make the dough so it should be just warm enough to help the yeast bloom, not too hot or the yeast will die. Pour in the milky tea and start the mixer at a slow speed till dry and wet ingredients are mixed well. Increase the speed by one level and, using the dough hook, knead the mix till you have a sticky but smooth dough. Add dry flour if required. On a floured surface turn out the dough and knead for a minute or two by hand. Flatten out the dough and scatter the drained fruit on it. Fold over the dough and knead to mix the fruit into the dough. I added the fruit in a couple of batches to distribute it better - add the initial lot, knead to mix, flatten dough again, add fruit and knead again to incorporate. Oil a proofing bowl and place the dough ball in it. Cover with a damp napkin and leave it aside to double. Once it has doubled remove again to your floured surface. Divide the dough into two and knead gently for a minute each. Place in greased loaf tins or shape into freestyle loaves and place on your baking sheet. Cover again with a damp towel and leave to rise for another hour or so. I used a well floured banetton for my loaf. Bake the breads at 180C for 30 to 40 minutes till golden brown on top and hollow sounding when tapped. If your bread is browning too fast cover loosely with foil. Cool on a wire rack completely before slicing. 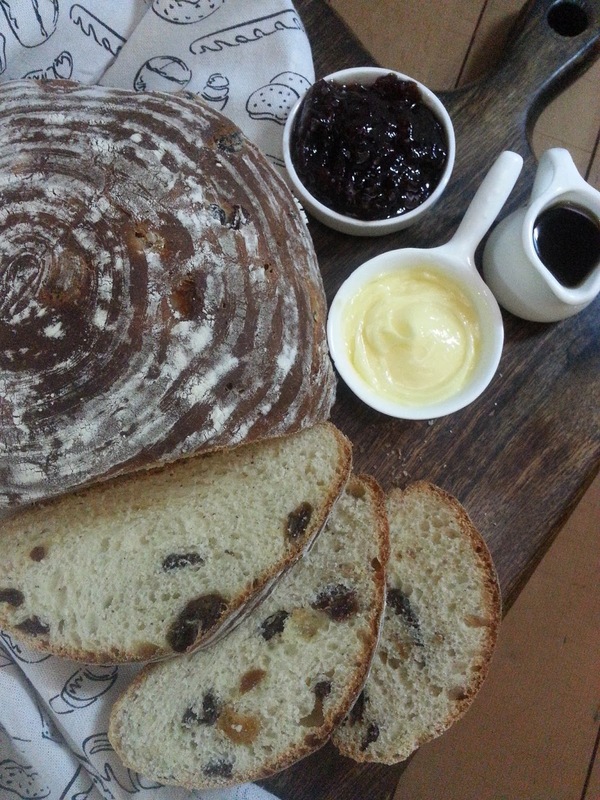 We had our Barmbrack for breakfast and tea, slathered with butter, jam and honey. This bread toasts well too. *Use any dried fruit to make up that 1 cup of fruit - raisins, prunes, apricots, sultanas, cherries, cranberries - whatever mix you like. I had that bag of Tesco's fruit so I used some of it. *Use regular strong tea. I didn't have any so I used the tulsi ginger tea a friend had sent a while back. How nice that some of it got used! *The original recipe calls for allspice powder. I didn't have any so I used more cinnamon. A mix of clove and cinnamon with a star anise thrown in would work quite well too. I love the look of your bread too.. still haven't made mine this month. Have you tried baking challah bread. Wow! Very nicely written post. The recipe that you have mentioned to bake a tea flavoured sweet fruits bread is truly enticing. Thanks for sharing it. I'm surely going to bake this bread soon for my family and friends.